Rebels Review: "A Princess on Lothal"
After a mid-season break--that just so happened to coincide with the release of The Force Awakens in theaters--Star Wars Rebels returned with a bang this week. From the moment early in the episode when The Ghost arrived, guns a-blazing, to rescue our trapped heroes it was clear we were in for a treat. The episode, "A Princess on Lothal", introduced us to a younger Princess Leia than we knew in A New Hope and laid some solid groundwork for this rest of this season. Since the announcement of Rebels back in 2013, one of my hopes for the series was that it include Leia in some capacity, and the series delivered on that in a big way this week. Of all the legacy characters Rebels has introduced over its season and a half Leia was by far the biggest risk. As one of the main characters of the Star Wars films, Leia's appearance had to be handled with extreme care. We've always known of Leia's history as a double agent, serving Alderaan in the Imperial senate while secretly supporting and organizing the Rebellion that would one day topple the Empire. Rebels managed to walk the line perfectly, showing Leia transitioning seamlessly between her Imperial guise and her true rebel self. The episode also did an excellent job at showing that the Empire is already beginning to distrust Leia, Bail, and Alderaan in general. It's clear in A New Hope that neither Vader nor Tarkin nor anybody else in the Empire truly believes that Leia is just "a member of the Imperial Senate, on a diplomatic mission to Alderaan". In this episode, we learn that Leia's ships have a history of falling into Rebel hands, feeding the Empire's distrust of her. Leia's ability to avoid getting caught in the web of treason she is spinning through her ingenuity shows why Tarkin was so keen to order her termination aboard the Death Star. The other thing this episode does so well is to showcase Leia’s abilities as a leader who can inspire those around her, both in a military sense and personally. We this time and again throughout the episode. We see her inspire the down-on-their-luck crew of The Ghost to put their heads together and come up with a plan to steal back her ships from the Empire. Also, her conversation with Ezra serves as an in-universe pre-cursor to her conversation with Finn at the Resistance base in The Force Awakens. Ezra, like Finn, was at a difficult turning point in his life, having learned the fate of his parents in the last episode, losing one of his key motivations for being a Rebel. In The Force Awakens, Finn was at a similar turning point having turned his back on The First Order only to immediately lose one of the first people to ever truly care for him, Rey. In both instances, Leia was able to help these lost souls find new purpose in life and inspire them to join her cause. Speaking of Ezra, I was glad to see that Rebels took the time this week to show him still grieving over the loss of his parents. The deaths of Mira and Emphraim Bridger were such a focal point of the mid-season finale, "Legacy", that it would have seemed wrong for Ezra to immediately go back to his usual self. Instead, the episode takes the time to let Ezra have moments of sadness as he works to come to terms with this news. However, we know how loss of family can effect a Jedi. The death of Shmi Skywalker in Attack of the Clones led to Anakin Skywalker taking one of his first major steps towards the Dark Side. The moment where Ezra sees his reflection in the Cadet helmet he's holding felt like an ominous bit of foreshadowing. Not that I expect Ezra will join the Empire per se, but rather that there is darkness in his future. This may not be what the show intended this moment to be, but after seeing the mid-season trailer last week it's hard not to think darkness may be in store for young Ezra. "A Princess on Lothal" once again showed the Rebels gaining a new ally in the fight against the Empire. Ryder Azoti, the former governor of Lothal we met in "Legacy", joined the growing ranks of secondary characters who have allied themselves with the Rebellion after meeting the crew of The Ghost. Ryder’s initial hesitance, a result of spending time in an Imperial prison, had me believing he would die, sacrificing himself for the Rebellion and so that the Bridger's son could live on. Instead, I was pleased to see that he made it out of this week alive and could potentially becoming a recurring character on the series. It has long been suspected that there is more to Lothal than meets the eye, and Ryder could serve as a means to further explore this mystery. The humor in this episode was well done, and appropriate given the circumstances. Zeb "making it look good" by knocking out a disguised Ezra and Kanan, as well as Leia's banter with the Imperial officer whose ship she always needed to borrow, helped to break the tension with moments of levity in an otherwise dark episode. 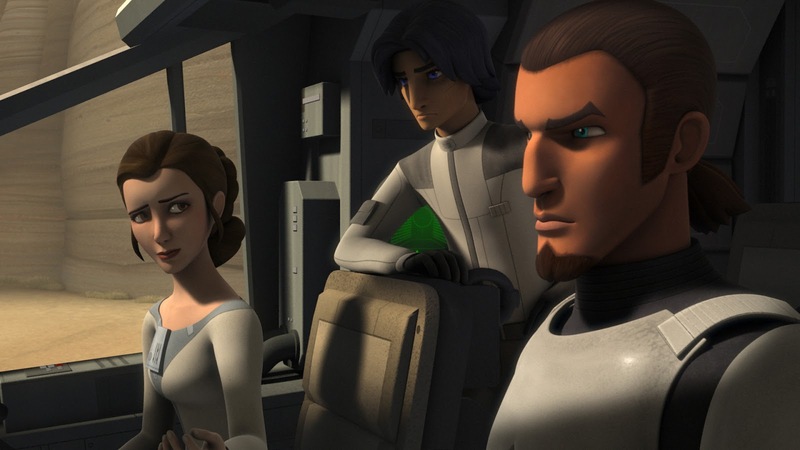 "A Princess on Lothal" is the first time this season where I feel that Rebels really managed to strike the perfect balance between action, dark intensity, quieter character moments, and humor. The episode was so well paced, nothing felt rushed or too drawn out. Every moment was allowed to breathe, while still driving the action forward. My only nitpicks about this episode are minor things. First, we know stormtroopers are legendary for their bad aim but the fact that they missed Ryder and Chopper several times while they were disabling the gravity locks with no cover and no return fire was a new low for the Imperial troops. The other thing, and this is not so much a criticism of the episode as it is something I just would have liked to see, is that we didn't get any real interaction between Leia and Hera. We know they spent time together off screen, Sabine refers to this in dialogue, but I would have loved to see Hera, a true believer in the Rebel cause, and Leia, one of the leaders of the Rebellion, interact. However, as discussed above, the pacing in this episode was just about perfect and squeezing in a scene like this would have likely lead to the episode feeling rushed. "A Princess on Lothal" represents a return to greatness for Star Wars Rebels. The episode was an example of the show at its best, with characters old and new offering something fresh to the story. Hopefully the series can carry this momentum forward for the final nine episodes of Season Two. On its own, "A Princess on Lothal" was just about everything I hoped it would be and stands out as one of the best episodes of the series thus far. Check out my reviews for the first half of Season Two here.